I just received the Mill Village Raid recently and am excited to add several Lego animals to my Lego universe. After coming out of the Dark Ages, I bought mostly Star Wars, but expanded to Castle and City with a big reason being Lego animals. Any new set that comes with a unique Lego animal is pretty much a must have to me, such as the Farm and PoP sets. The set that got me to expand from Star Wars was the Medievil Marketplaces. It comes with 2 brown cows, but also constructed ducks and chicken. With the Mill Village Raid including proper Lego chickens, I'm wondering how many people are content with displaying both versions of the birds to their diromas. I hope Lego continues to add more Lego animals to future sets and re-release other animals such as the elephant. I wonder what people's wish list are, but I'm sure the goal is to eventually have every animal represented in Lego form. To add more to the farm scene, I'd like a sheep. For the zoo scene, I'd like for lions, tigers and giraffe. For Xmas, I'd like reindeers. For now these will have to be represented by Lego bricks. Yeah I found that the brickbuilt chickens as found in the MMV are pretty much redundant now that there are moulded ones. Looks odd displaying them side by side. It seemed an odd choice of animal to make considering that the brickbuilt version was a good solution. I'd hope to see sheep and other cross-theme animals (fit with castle and city themes) such as a donkey and a generic deer torso that could have changeable 'horns' eg to use a a stag/reindeer/antelope. And maybe some ducks and rabbits. One or two stud like the rats. The lego animals are amazing, they appeal to me so much. I would love more prefabricated ones, but also, some instructions for more minifig size brick built ones would be great. My creativity is sadly lacking in this department. I'd love more zoo animals and farm animals too. I think the old elephant is ugly though! I love the chickens and goats! They are so little and awesome! I never really liked brick built animals, unless it was a really inventive giant squid or something. IF I were to, I think I would only want to display the proper animals. I do quite like the animals, the pig and goat in MVR are really nice, but at what point do they become 'just plastic animals' and not Lego?? If all they are going to do is mould all different animal shapes I am not sure what the point is or what makes them different from the millions of other plastic animals on sale (other than having stud holes in their feet). I see princedraven's point, but then again Lego established Lego animals pretty early with the horse in 1984. I don't believe its introduction had a negative impact in creativity in the Lego world, but complimented the playability of Lego with the minifig. I think in terms of minifig scale, it is only natural that more animals are Legoed (not sure about the proper term) as the horse. I'm not sure why the horse should be considered a special animal. I would think the dog could have been molded first. Some people consider this period of Lego popularity to be a Golden Age. I think a good reason for this is attributed to the expanding library and colors of Lego pieces. Back when I started with Lego, there was only the horse and each minifig had the same expression. I don't think Lego food was introduced yet and minifig accessories were pretty rare. Lego definitely has to balance playability and creativity. Unfortunately creativity has taken a back seat with Lego spoon feeding us these great new set designs each year. My creativity is pretty low now and I depend primarily on Lego designs to create my Lego world... which I'm more than happy to accept. I'm a builder and less of a creator. ^^ I agree that the horse is a real compliment, but see it almost as a minifig accessory, my concern is, if they release a Lego Zoo, which I have heard call for and in some ways love the idea (someone suggested a modular zoo which I think would be great! ), but can see how it would just be lots of molded animals. When it is one or 2 to compliment a set, so the soldiers have something to ride or a cat on a modular roof or as stated a pig and goat in MVR I think they work great, but if it is more than a couple I would be concerned it turns into a playset not a constructon set. Yeah fair enough. As long as its a novelty and not the main focus of a set it should be just like any other accessory. A zoo as I can imagine it would be boring to an AFOL for sure if it was a few molded lumps and some grass and fences. Choice is good; moulded or brick-built is the builders choice. I guess I personally prefer the brick-built birds in the MMV set over the new moulded chickens ... but then I'm not so keen on the newer 'duplo-esque' moulded animals. Rather than a zoo, a safari theme would be more appealling to both children and collectors. A pair of figures with a jeep observing some antelope and a lion, a helicopter flying over a couple of elephants and giraffes, a boat on the river with a hippopatumus and some crocodiles, a photographer and some chimpanzees or gorillas, a tent camp with an assortment of the above animals...the potential is far more impressive. You forgot the scorpion and the upcoming chimpanzee (Series 5 figures) not to mention a few Scala animals (several types of dogs and cats, including the one you listed, were found in this line first) that could stand in as other types of creatures much like the Scala kitten doubles as the Lego cat. The scorpion I did forget about (thanks, added now); the chimp I excluded because it's not out yet; I chose to deliberately exclude the Belville/Scala animals ... that rabbit still gives me nightmares ... http://www.bricklink.com/catalogItem.asp?P=33207 ... the kitten/cat I included as it's been extensively used in 'system' sets. You included the cat though and it originated as a kitten in the Belville/Scala line. The starfish, crab and clam also originated there. Glad it's not just me that find the rabbit terrifying - why is so huge?? I've got one in my Holiday Train set, and it just looks ridiculous. I got one of the belville (?) dogs http://www.bricklink.com/catalogItem.asp?P=6201 in an eBay lot. Thought it might be just a bit larger than minfig scale like a st.Bernard or something, but it's huge! like the hound of the baskervilles! The rabbit is a ridiculous scale even for scala. A minfig scale one like the mice would be cool. Anything which can be brick built well should be left IMO eg llamas and sheep, with new moulds reserved for smaller animals which cant be brick built e.g. a new rabbit or a fox would be good. Someone should really produce a book of all of these things! ^ Those sheep are awesome, probably sounds silly as they look like they only have about 12 peices in them, but have you instructions on how to make them? Or pictures from other angles? The sheep are nice but that horse is awesome! That is so cool and when I see the parts used it shows I really have a long way to go in my creativity. I mean I wouldn't have thought to use half those pieces. Thats really cool. I love the llama (?) - i have NO creativity when it comes to making stuff. But copying is fine. Any other animals out there please? They look like minifig hands to me. I actually like the animals because, like the mini-figures, they're meant to represent living creatures so having specific molds for them helps to distinguish them from structures. They're not completely useless outside of representing their respective animals either as a number of them have been used to depict ornamentation (the parrot and frog most prominently though others like the bat, swordfish, etc. have been used as well). That said, I'm not that fond of the newer ones because they've lost a bit of that Lego feel. The horse is a bit blocky and I like that just as I liked the old dog. They matched the blocky feel of the mini-figures. The new dog though is too smooth as is the goat. I agree with prof that animal molds are consistent with minifigs as being living creatures. It seems to me, the smaller the animal, the more detailed and smoothier the mold. For example, the frog and cat are shaped without any blockiness. As we get to bigger in size, the blockiness comes out. Old dog vs new dog: new dog has paint app, old dog has dimple eyes, new dog is slightly smoother. To me, I think the main difference isn't so much the mold, but the paint app. Chicken observation... why does it have a prominent stud at its feet? The other bird or single stud animals do not have that feature. Couldn't they have transitioned the stud better like the bat? Maybe it's their attempt at making it appear more Lego? The reason the cat and frog are they way they are is because they were from the Belville/Scala line. The old dog, by contrast, was first created for the Lego system sets (Harry Potter and City). Just bumping this thread for new people and perhaps @bor2112 who is fond of the lego pigs ;) But mainly because we have a bunch of new animals coming with the friends sets. Most look overly cutesy, (why change the horse?) But the hedgehog - oh how I crave it! @sav, which set has the hedgehog in? I think the vet set. @lostintranslation got a hedgehog already! ^oooo - not thought to look on YouTube - that's good to see. Hope they do a TV series to support the line. I'm sure it will be dire, but I desperately want this to succeed. Now that they have a bear, they should add additional forest animals like a deer or fox to their new city sets. The new dinos are great too. I like the molded animals. As they represent living creatures and all that, seems to make sense. The minifig is composed of like 3 or 4 pieces. A horse or cow is three pieces too. There is just a little bit of building involved. My 8 year old is asking to build a Lego zoo. But personally I don't like the molded animals, and creating animals with bricks will be tough. Any ideas people? What does everyone think of the new horse mold that appears in LOTR? I'll be interested to see if existing accessories (barding, head armour etc) fit or if the old horse has been made obsolete. There must be a market for more animals so why is it that their appearances in sets are so random!? It takes a Mount Everest adventure to see the addition of an elephant when a Safari or Circus couldve used one years ago. 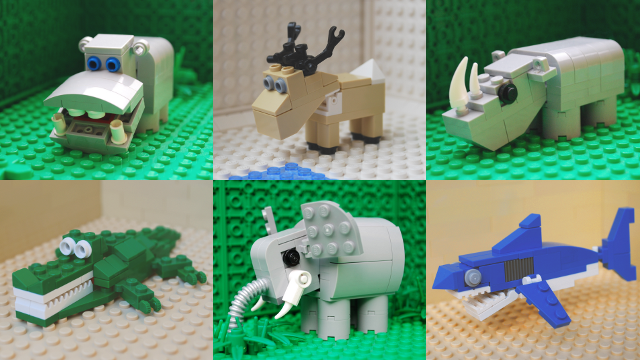 In Lego sets why do you think so many animals have been avoided? What animals would you like to see? Do you build your own animals? I have a collection of brick-built, City-scale LEGO animals in the making, with free instructions and all, and a CUUSOO project to go with it. Click the link for more animals. I have a long todo list, so stay tuned. Oh, and the free building instructions (images, LDD and LDraw files) are over on my BrickShelf and Rebrickable pages. I'm on Flickr, too. Support my project if you wish, spread the word if you can. Peace out. I like them both, and when I was a kid I never minded having both brick build horses as well as 'Lego mini-animal-fig' horses. I used to play with both together. (see #6083 and #6021 i.e.) The Lego animals/creatures all look really charming, I just sometimes think it is too bad that they have so few or no articulation points at all, in comparison to the minifigs. Which is of course no issue with the tiny animals such as cats, rats, frogs etcetera. In that respect the new Lego horse is an improvement. The newly molded head I also like better, but I understand why especially this may look less 'Legoish' to others. Of course the Hulk and the Cave troll aren't animals but fantasy creatures, although I do like them very much, I am somewhat puzzled why these bigminifigs have such limited articulation, and posing possibilities, I don't have any elephants, but if I am not mistaken that animal is also pretty much one big chunck of plastic.
" I actually like the animals because, like the mini-figures, they're meant to represent living creatures so having specific molds for them helps to distinguish them from structures. They're not completely useless outside of representing their respective animals either as a number of them have been used to depict ornamentation (the parrot and frog most prominently though others like the bat, swordfish, etc. have been used as well). "